Jadon Sancho waited for his moment and timed his run perfectly, bursting into the Czech Republic box behind left-back Filip Novak to meet Harry Kane's through-ball without breaking his stride. His first-time pass to the far post was firmly struck, but Raheem Sterling was on his toes. One-nil England. And another boon to Sancho's burgeoning reputation. 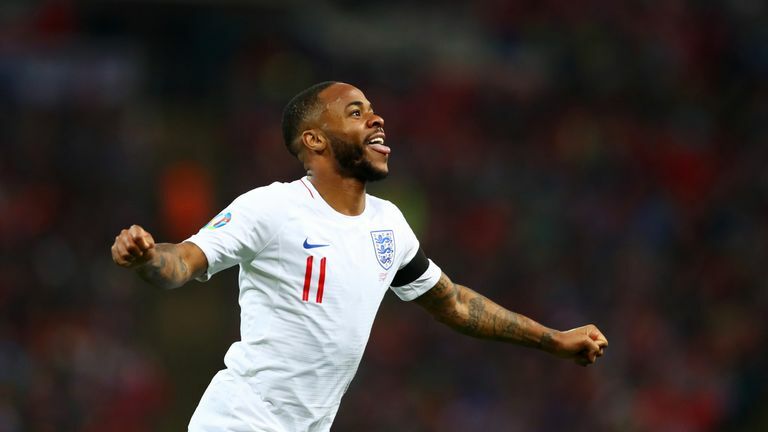 The opener set the tone of the evening for Sterling, who finished the game with the first hat-trick of his England career, and it did the same for Sancho. This was another hugely encouraging performance from a player whose potential seems to have no limits. It is remarkable to think that it is less than 18 months since Sancho made the first senior appearance of his career - a six-minute cameo in a 2-2 draw between Borussia Dortmund and Eintracht Frankfurt in the Bundesliga - but his extraordinary progress shows no signs of slowing down. On Friday night, still three days shy of his 19th birthday, he became the third-youngest player to start a competitive international for England at Wembley behind only Duncan Edwards and Michael Owen. It is esteemed company but all the early evidence suggests Sancho belongs there. A buzz of excitement travelled around the stadium every time he got on the ball, and there were positive signs as early as the first minute, when he popped up in the centre circle, turned his man and showed impressive awareness to send Kyle Walker galloping into space down the right flank. Southgate had given Sancho licence to drift into those central areas - there was a smart pass to release Jordan Henderson from a similar position soon afterwards - but it was on the flank, one-on-one with the beleaguered Novak, that he was most effective. It was from there that he provided his assist - his 16th of the season for club and country - and from then on his confidence grew. Shortly before half-time, he drew howls of delight from the buoyant Wembley crowd, nutmegging Novak and pulling off an impudent drag-back to win a corner off another red-shirted defender. Sancho was honing those skills on the concrete courts of south London just a few miles away not so long ago, and he is encouraged to play with the same kind of freedom now. But this was another display to show that he offers end product as well as flair. By the end of the game, he had created more chances than anyone else on the pitch. Sancho stayed on for the full 90 minutes, meaning there was even an opportunity to see him link up with Callum Hudson-Odoi, his team-mate in England's U17 World Cup winning team just 18 months ago and another rising star who is sure to play a prominent role in England's future. They combined for the fifth goal, with Sancho charging inside from the right flank in exhilarating style before finding his fellow teenager. Hudson-Odoi's shot was then parried by Jiri Pavlenka, but the loose ball bounced back into the net off Tomas Kalas to compound the Czechs' misery. Not everything came off for Sancho - the statistics showed he lost possession more times than any of his team-mates and he also spurned an excellent scoring chance midway through the second half - but what's most important to Southgate is that he and the rest of England's youngsters feel comfortable enough to express themselves. "I think the rest of the players make it an environment where they can come in and be themselves," he explained in his post-match press conference. "They don't feel inhibited around the camp and so they don't feel inhibited on the pitch. You can see that by the way they played. It's a way of working which is clearly helping Sancho. He was roped into an interview which was broadcast around the stadium straight after the final whistle, his boyish shyness a reminder that he is not much older than a sixth-former, but out on the pitch he seems to be growing in maturity by the week. This was just another step in the seemingly unstoppable rise of Jadon Sancho.